- Just as certain as death and taxes is the knowledge that we shall one day be forced to learn to live without oil. Exactly when that day will dawn nobody knows, but people in middle age today can probably expect to be here for it. Long before it arrives we shall have had to commit ourselves to one or more of several possible energy futures. And the momentous decisions we take in the next few years will determine whether our heirs thank or curse us for the energy choices we bequeath to them. There will always be some oil somewhere, but it may soon cost too much to extract and burn it. 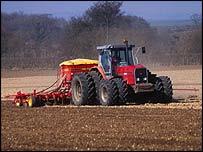 It may be too technically difficult, too expensive compared with other fuels, or too polluting. Who holds the world's oil and how long will it last? An article in Scientific American in March 1998 by Dr Colin Campbell and Jean Laherrere concluded: "The world is not running out of oil - at least not yet. "What our society does face, and soon, is the end of the abundant and cheap oil on which all industrial nations depend." 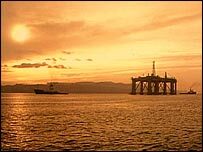 They suggested there were perhaps 1,000 billion barrels of conventional oil still to be produced, though the US Geological Survey's World Petroleum Assessment 2000 put the figure at about 3,000 billion barrels. The world is now producing about 75 million barrels per day (bpd). Conservative (for which read pessimistic) analysts say global oil production from all possible sources, including shale, bitumen and deep-water wells, will peak at around 2015 at about 90 million bpd, allowing a fairly modest increase in consumption. "Peaking is at hand, not years away... If I'm right, the unforeseen consequences are devastating"
On Campbell and Laherrere's downbeat estimate, that should last about 30 years at 90 million bpd, so drastic change could be necessary soon after 2030. And it would be drastic: 90% of the world's transport depends on oil, for a start. Most of the chemical and plastic trappings of life which we scarcely notice - furniture, pharmaceuticals, communications - need oil as a feedstock. The real pessimists want us to stop using oil for transport immediately and keep it for irreplaceable purposes like these. In May 2003 the Association for the Study of Peak Oil and Gas (Aspo), founded by Colin Campbell, held a workshop on oil depletion in Paris. One of the speakers was an investment banker, Matthew Simmons, a former adviser to President Bush's administration. "I think basically that peaking of oil will never be accurately predicted until after the fact. But the event will occur, and my analysis is... that peaking is at hand, not years away. "If I'm right, the unforeseen consequences are devastating... If the world's oil supply does peak, the world's issues start to look very different. "There really aren't any good energy solutions for bridges, to buy some time, from oil and gas to the alternatives. The only alternative right now is to shrink our economies." Aspo suggests the key date is not when the oil runs out, but when production peaks, meaning supplies decline. It believes the peak may come by about 2010. Fundamental change may be closing on us fast. 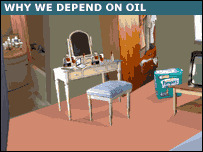 And even if the oil is there, we may do better to leave it untouched. Many scientists are arguing for cuts in emissions of the main greenhouse gas we produce, carbon dioxide, by at least 60% by mid-century, to try to avoid runaway climate change. That would mean burning far less oil than today, not looking for more. There are other forms of energy, and many are falling fast in price and will soon compete with oil on cost, if not for convenience. So there is every reason to plan for the post-oil age. Does it have to be devastating? Different, yes - but our forebears lived without oil and thought themselves none the worse. We shall have to do the same, so we might as well make the best of it. And the best might even be an improvement on today.